Here at Costume Agent, we strive to offer a wide variety of mannequins for holidays, parties, special events, and more. Our wholesale catalog is packed with items from your favorite movies or TV shows. We strive to bring you quality products that your customers would love. In the inflatables section, you can browse our mannequins. We strive to offer different types of blow ups to fit your Halloween, party, or event needs. 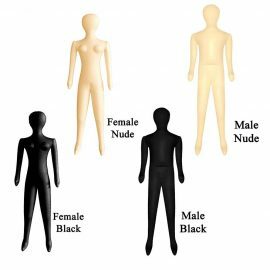 You can choose from different sizes, styles, and genders. The product material is high quality shimmering vinyl in order to assure stability and performance.